Get your mitts on free Benefit products simply by swapping any used skincare product! How awesome is this?! Until Saturday June 27th, Benefit have 20,000 samples of their facial skincare products to give away. Simply take your old, used skincare product such as moisturiser, toner, cleanser etc to your nearest >Boots Benefit counter< and you will be given not only a free 5 to 10 minute skin consultation but then you can choose one of 3 free Benefit samples to take home with you. I first fell in love with Benefit in my early 20's and since then the range has expanded ten-fold, it's a great quality range and the products last forever! Get there fast as the 20,000 are sure to go quickly! It's one sample per customer visit and you don't need to book your consultation. But wait, before you scamper off to your nearest Boots, it gets better! If you decide you like the products... Boots are also currently doing a promotion on Benefit skincare when you shop online. 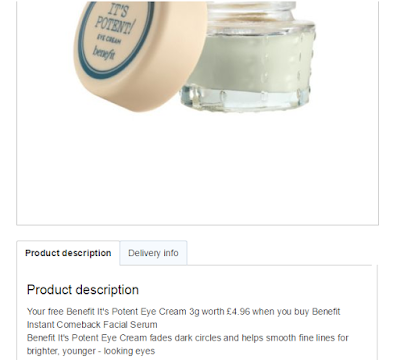 So, if you then go ahead and buy the full size Instant Comeback Facial Serum (because let's face it, it's gonna be brilliant, it's Benefit) you will get another free 3g pot of Potent eye cream. They are also giving away another free gift of Benefit Total Moisture Deluxe when you buy 3 or more products across the whole range - not just skincare. Show us how you got on by sharing your pics of your free Benefit Cosmetics and skincare products with us on Instagram, Twitter, Facebook or now... Tumblr.